Original, official complete magazine size 1997 Rose Bowl Media Guide. 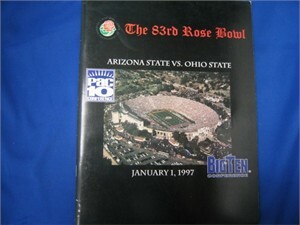 Arizona State lost to Ohio State 20-17 in one of the most exciting Rose Bowl finishes ever. Among the future NFL stars that played in this game: Orlando Pace, Jake Plummer, Shawn Springs and Pat Tillman. HAS MINOR FLAWS/WEAR. ONLY ONE AVAILABLE FOR SALE.